Larson Educational Services, the premier provider of Real Estate Education in Southwest Florida is holding a Real Estate Career Night Tuesday, March 2, 2010 from 6:30pm-7:30pm!!! Anybody interested in learning more about what it takes to enter the Real Estate industry, including education and examination requirements, as well as the Florida licensing fees, is welcome to join us. We’ll also have information from local Real Estate Companies available to take home with you. We are a family-owned business with 30 years of Real Estate education experience. If you’ve ever thought about getting into Real Estate, this is a great opportunity to learn more about it. Also, one lucky attendee will win a $150 Scholarship toward our Real Estate Licensing education. 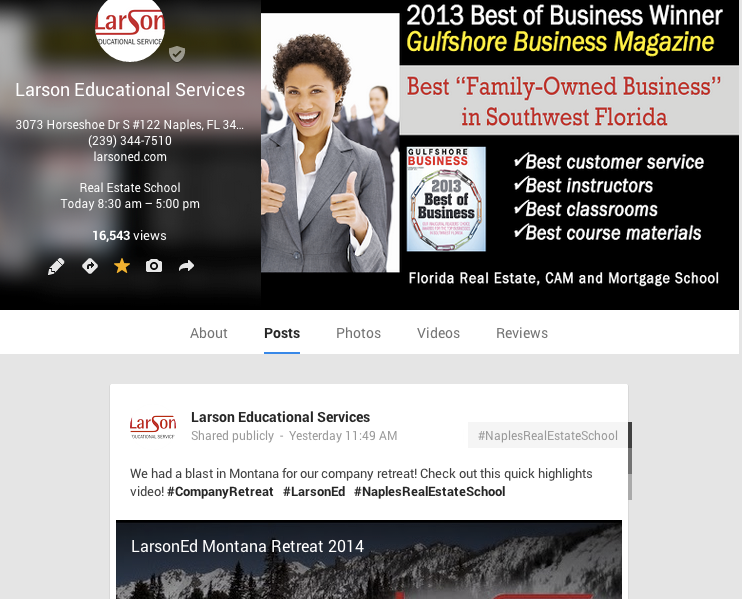 Click here to go to www.LarsonEd.com. We are located in the Royal Palm Square Shopping Center at the base of the Midpoint Bridge. Naples real estate school Larson Educational Services gives you a rundown of 9 traits that make a good real estate agent. Do any of these sound familiar to you? Maybe a few changes in your approach could make a you a better agent. What do you think makes a good agent? Comment below with your own traits.